Hopefully you’ve experienced the singular joy of a ripe tomato sliced thick, its juices at peak flavor, a melange of sweetness, acid, and freshness. To know the joy of a wonderful tomato is to also know the heartbreak of a sad, mealy tomato with bland pink innards, typified by the disappointments you find topping fast-food sandwiches. If it’s flavorful tomatoes you’re seeking, experts say, you must keep them away from your refrigerator. 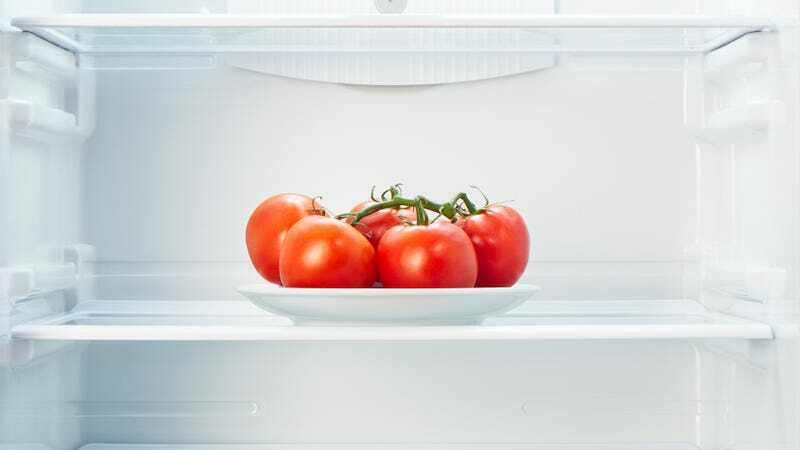 “Postharvest practices such as refrigeration can irreversibly damage flavor,” writes Dr. Harry Klee of the University of Florida, a biochemist who is considered one of the top tomato-flavor researchers in the world. He’s studied aspects of tomato genetics that create the volatile compounds responsible for flavor, and has found that refrigeration reduces those compounds. Tomato industry groups echo his no-refrigeration advice: “All the science that we’ve seen indicates that you should never refrigerate tomatoes,” Michael Schadler, manager of the Florida Tomato Committee, tells The Takeout. I ask him whether suppliers refrigerate tomatoes between harvest the grocery store anyway, which would kill those tasty compounds. Self-described “tomato nerd” and Tomatoland author Barry Estabrook isn’t convinced by Gritzer’s findings. “He threw a monkey wrench in things, sure, but was it scientifically valid? I’m sure he found what he found but I don’t know how credible his research would have been,” Estabrook tells The Takeout. He says the small sample size and methods of Gritzer’s study make his findings less valid than the many taste testes and scientifically conducted surveys conducted by researchers like Klee and other industry groups over the years that have led to the anti-refrigeration advice. He says 68 degrees is the optimal storage temperature, and he himself sticks with tried-and-true wisdom.